Fall is a great time to collect seeds for saving! Seed saving can be done by all. Collecting seeds from your garden is a great way to ensure you will have the selection of plants wanted for the next growing season. Gardeners often collect seeds from a favorite flowering plant as well as heirloom vegetables and herbs to swap with fellow gardening friends. These are great resources for getting plants that will be well adapted to our area. Seed collecting is a great activity for children. The act of collecting the seeds can be made into games like a scavenger hunt, seed counting, comparison and identification making it a family adventure. Taking a closer look at the seeds and talking to your children about pollination, what seeds are, what seeds we eat, and the idea of preserving plant types are all subjects that can be explored. Seeds are used in other ways too! Seeds have been used to make jewelry and dyes for centuries. Seeds can be used for art projects as well. 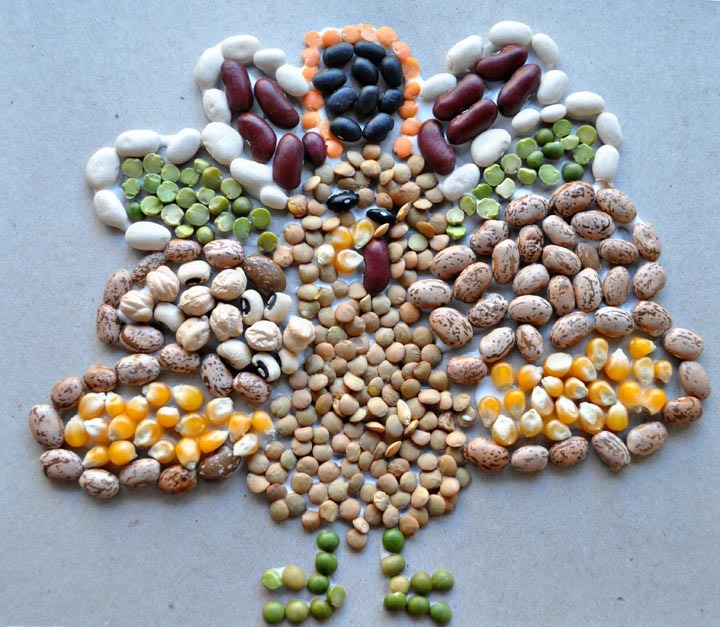 Seed mosaics are a favorite of children and are easy to make with seeds left over from harvest. Use leftover seeds of any kind, draw a pattern to fill in, use Elmer’s glue and place the seeds in whatever pattern or design is desired. It’s so much fun to get the family involved in gardening!